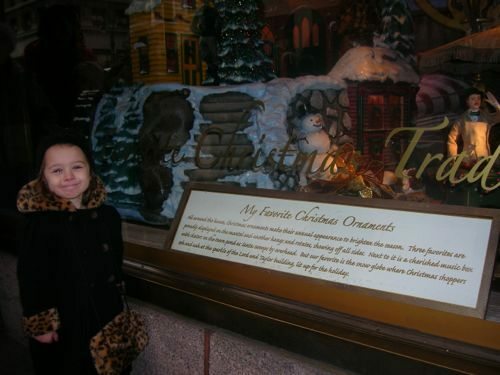 Posted on: November 19th, 2018	by Melanie C.
We originally published this list of Things to Do in New York City with Kids During Christmas and the must see Christmas attractions in New York City in 2013, but we update this annually to include the newest New York City Christmas attractions. Take a look at all the things to do with kids in New York City for Christmas 2018. It’s Christmas in New York City! This is my family’s yearly tradition! For some of you this might give you the shakes. The crowds, the cold, the traffic, the CROWDS. 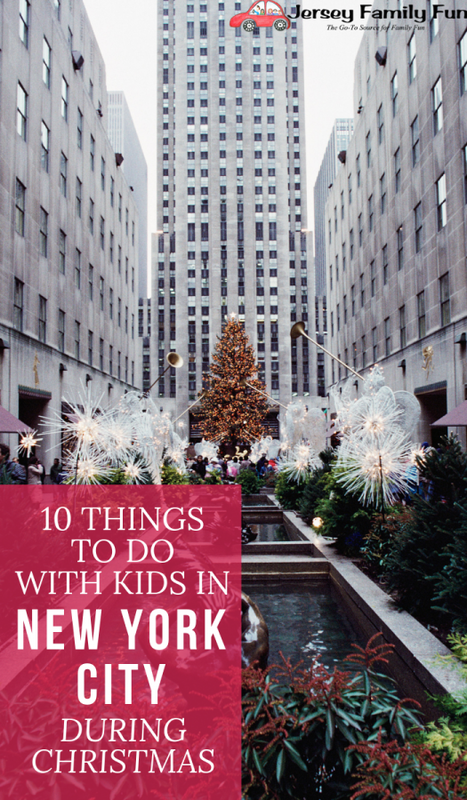 Yes, it can be intimidating and it might seem much more fun to snuggle under a blanket by your tree and watch a Christmas movie, but if you follow some of these tips for visiting NYC at Christmastime … with kids, having a day in New York City at Christmastime can be memorable and maybe even become your tradition too. Get ready for these things to do in New York City with kids during Christmas. 5 Tips for Visiting NYC at Christmastime with kids! Figure out how you’re getting there. Driving can save money, but parking might break your budget. Take a look at some parking apps before you go for discounts or spot reservations. If you have a car you can drive in instead of a SUV you’ll save money as well. 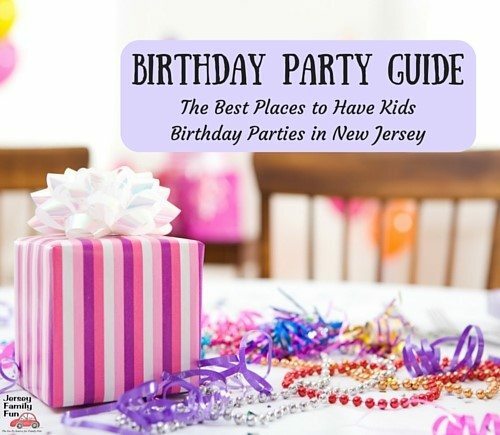 There are plenty of mass transit options, PATH, NJTransit, Seastreak Ferry and NY Waterway. Up to certain ages and on certain days kids ride free – and everyday kids 11 and under ride free on NY Waterway ferry! There are also private bus companies operating out of different areas of New Jersey that could offer a stress free ride into midtown. Decide what’s most important to see. Is it store windows? The Rockefeller Tree? Santa at Macy’s? All of those are located close to each other and you can probably see all in one day. Remember that now Macy’s Santa is available by reservation ONLY. Make sure you check this website and make your reservation (scheduling begins November 18) so as not to have disappointed kids! But as mentioned – THE CROWDS. Be sure to keep expectations low in case it takes too long or is just too cold to get anywhere. Consider visiting on a weekday. The rush hour traffic/congestion might be worse, but the visiting crowds will be better! 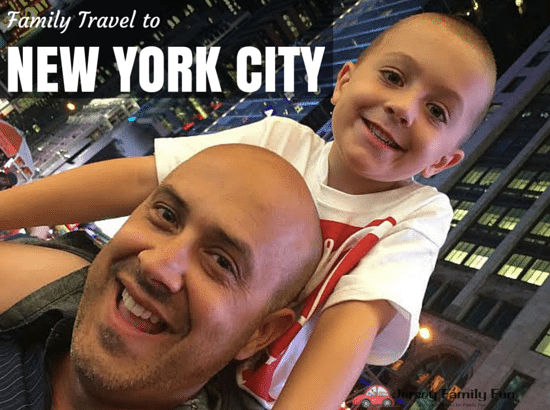 Now that we’ve shared our tips for visiting New York City with kids it’s time to help you find things to do in New York City with kids. Aside from the previous mentions, my personal favorite is the Winter Village at Bryant Park (located between 5th and 6th Avenues, and 40 and 42 Streets). There you’ll find a smaller ice rink, smaller tree (with decorations! ), and fewer crowds. There are also plenty of places to eat and shop, and just take a load off those tired feet. The smaller feels cozier to me, and there’s plenty of tables to rest at – you might even catch an outdoor movie! Their tree lighting ceremony is December 4. The Radio City Christmas Spectacular at Radio City Music Hall is a must see! This year there are plenty of live shows to see including How the Grinch Stole Christmas at Madison Square Garden, performances of The Nutcracker throughout the city, and plenty of family friendly Broadway shows.If you find yourself going into the city for any of those, you can surely take a detour to see the Rockefeller Center Tree or the Bryant Park tree. In 1931 a group of construction workers set up the first (unofficial) Rockefeller Center Christmas tree in Rockefeller Plaza (5th Avenue, 48th-51st Streets). How far we’ve come! The 2018 Rockefeller Center Tree is 75 years old and 72 feet tall. It will arrive at the plaza on November 10 with a tree raising from 7:30 AM until about noon. It will remain unlit until the ceremony on November 28 when 50,000 lights will be switched on! The lighting is a nationally televised event with celebrities but there are other events on the plaza too. What about a Merry Tuba Christmas concert on December 9 at 3:30? Or a twirl on the ice rink? It’s open daily and is a truly unique experience! The tree will remain at the plaza until January 7. Visit the Paley Center for Media (25 West 52 Street) for its transformation into a wonderland during “It’s Holiday Time in Paleyland.” Free hot cocoa, visits with Santa, nonstop Holiday classics to view, it’s a must see FREE event. Our Jersey Family Fun writer got to visit on opening night in 2016! The New York City department store windows are magical. They start unveiling as early as November 10th! The old standbys are Macy’s Herald Square (34th Street between 6th and 7th Avenues), Lord and Taylor on 5th at 38th Street (massively scaled back for 2018 as the store is closing), and Saks on 5th and 49th Street. Tiffany’s on 5th, Bergdof Goodman at 5th and 57th Street and Bloomingdale’s at 60th and Lexington Avenue have also put on a show in past years. The window displays are a distinctly New York thing, where you can be transported to old time NYC, meet the newest character Sunny the Snowpal, or look at the highest of high fashion. This year’s Macy’s windows are unveiled on November 15th, so even a pre-Thanksgiving visit will allow you to see them! A Lord and Taylor window from years past. Maybe your travel plans bring you into Grand Central Terminal (42nd Street and Park Avenue)? While you’re there, check out the New York Transit Museum’s Holiday Train Show. The 17th annual display is open from November 15 – February 24. Are you heading toward Central Park instead? The park has some events like a guided holiday walking tour and a marionette show. Wollman Rink is open daily for public skate. The iconic horse and carriage rides are available at Central Park South between 5th and 6th. Would you rather view animals than ride them? The Central Park Zoo is open daily from 10 AM – 4:30 PM. If trains are REALLY your thing, look into the New York Botanical Garden’s Holiday Train show (2900 Southern Blvd, Bronx). Reservations are recommended. The Bronx is further than Manhattan for most of us, but it’s a show to be seen. The event runs from November 17 to January 21 so you can avoid the peak holiday season. Are you driving in? 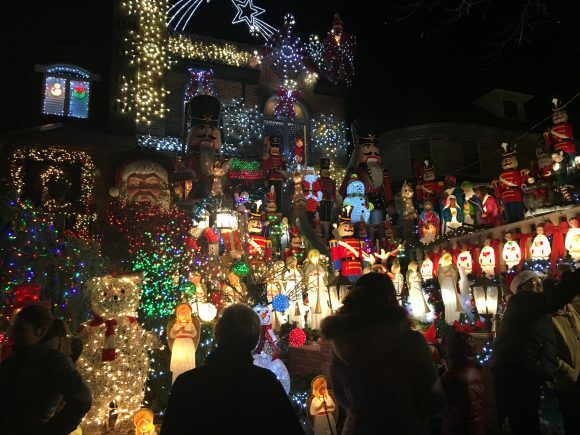 Consider taking a nighttime detour to Dyker Heights, Brooklyn for the outrageous Christmas displays. Live nativities, live Santas, lights to rival the Osborne Family … you won’t be disappointed! 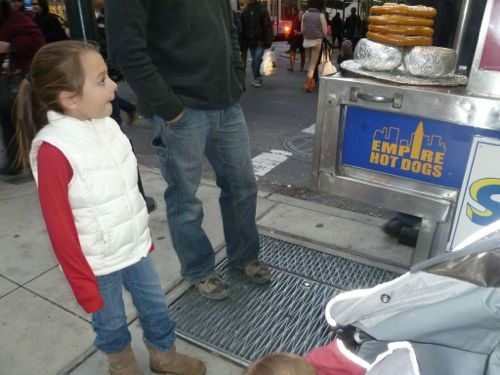 Find them anywhere from 80th to 85th Streets between Tenth and Fourteenth Avenues. New this year, admire the windows adorned in the Grinch theme. This year they are interactive AND include karaoke! 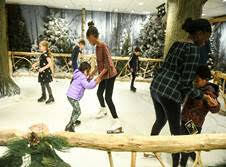 Then head inside for some fun features including an in-store skating rink, complimentary hot chocolate, a virtual sleigh ride experience, larger than life snow globes and a walk through gingerbread house. Not to be outdone by other New York City Christmas attractions Brookfield Place (230 Vesey Street) will offer Christmas fun in New York City. This season they will have a free performance of the Nutcracker, Santa, and the Luminaries light show as well. Is Macy’s Santaland too chaotic? There are plenty of other places to see Santa in NYC! Check out Bloomingdales, Bryant Park, even ABC Carpet & Home have hosted Santa Claus. And on December 2nd, you can see a Santa Rescue at the New York City Fire Museum. Viewing the rescue is free, but seeing Santa inside requires advance tickets. 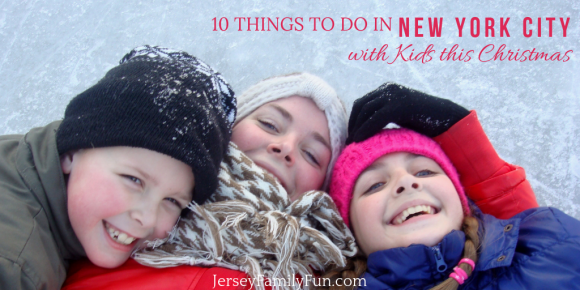 As you can see there really are more than 10 things to do in New York City with kids during Christmas. Maybe your children just want to see where the movies Miracle on 34th Street or Elf take place. Whatever you end up doing, make it memorable! Take lots of pictures, dress warm, and enjoy the magic. Oh and have a hot pretzel for me! Did we leave off your favorite NYC Christmas event? Do you have tips for visiting NYC at Christmastime ? Let us know! Click over to see the rest of our Family Travel to New York City series.